On April 6, 1917, the United States formally declared war on Germany following attacks by German U-boats on unarmed U.S. merchant ships and after the Germans tried to persuade Mexico to invade the U.S.
On 15 July 1917, the Wisconsin National Guard was activated for Federal Service. The unit in Watertown was Company E of the 5TH Wisconsin Infantry Regiment. Captain Albert F. Solliday, was in command, assisted by 1LT Jas. T. Hale and 2LT Lawrence W. Murphy. CPT Albert F. Solliday followed in his father’s footsteps in both his civilian and military pursuits. Like his father, he became a dentist and had a practice in Watertown for many years. Born in Watertown 23 Oct. 1871, he attended Watertown’s Lincoln School, then attended St. John’s Military Academy in Delafield, then Shattuck Military Academy in Faribault, MN, and Northwestern University Dental College in IL. Upon his return home after his deployment to France with the 32d “Red Arrow” Division during WWI, he became the inaugural commander of Watertown’s American Legion Post in 1919. He passed away in Watertown on 12 May 1958 at the age of 86. At this time, the unit’s armory was the old high school on E. Main St.
On 17 August 1917, Co. E left Watertown and went to Camp Douglas, Wisconsin. On 31 August 1917, the strength of Company E is listed at 3 officers and 86 enlisted men. On 25 September 1917, Co. E was sent from Camp Douglas, Wisconsin to Camp MacArthur, near Waco, Texas. The entire Wisconsin National Guard left the State and went to Camp MacArthur, near Waco, Texas. Once there, the Wisconsin and Michigan National Guards were consolidated to form the 32d “Red Arrow” Division. All of the Wisconsin National Guard units were reorganized and renamed to conform to the organization of Army Divisions at that time. The 5TH Wisconsin Infantry was no exception, it was broken up and parts of it assigned to the 57TH Depot Brigade. The 57TH Depot Brigade was only a temporary unit. Personnel assigned to the 57TH Depot Brigade were used to organize new units that were needed for the Division but were not in existence. Once all of its personnel were assigned to other units, the 57TH Depot Brigade ceased to exist. Many of the soldiers from Watertown were assigned to the 120TH or 121ST Machine Gun Battalions of the 32d “Red Arrow” Division. Once training was completed at Camp MacArthur, the 32d “Red Arrow” Division was shipped to France to fight in World War I. The unit in Watertown was Company E of the 5th Wisconsin Infantry Regiment. 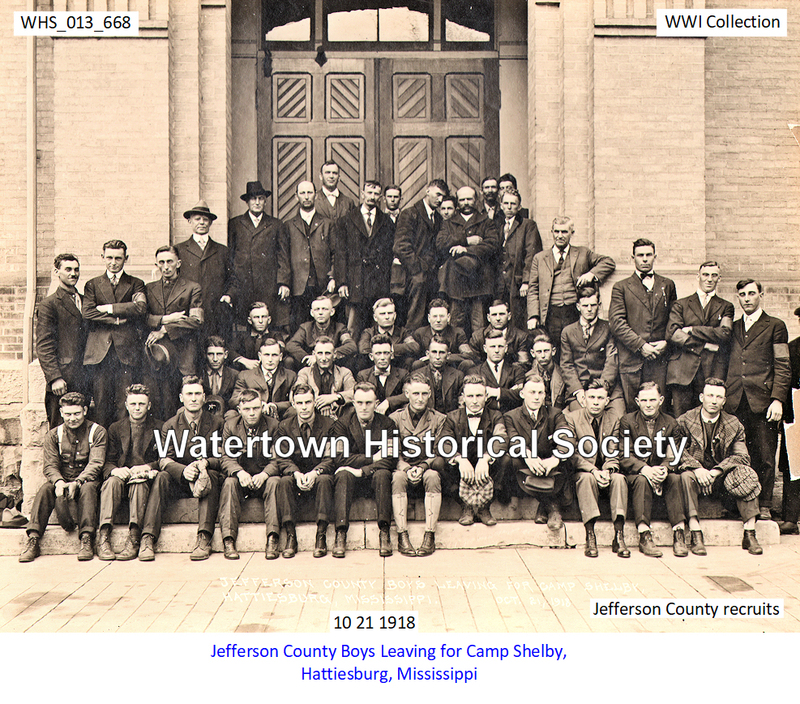 On 17 August 1917, Co. E left Watertown and went to Camp Douglas, WI. On 25 Sept 1917 the company was transferred to Waco, TX and became Company C, 120th Machine Gun Battalion and then for the duration of the war was knows as Company D. On 4 February the company left for Camp Merritt, N J with deployment to Brest France on 4 March, 1918. Armistice Day is commemorated every year on November 11 to mark the armistice signed between the Allies of World War I and Germany, for the cessation of hostilities on the Western Front of World War I, which took effect at eleven o'clock in the morning — the "eleventh hour of the eleventh day of the eleventh month" of 1918. It is surprising that in a city the size of Watertown, there is no militia company. There are any number of places with not half of its population that have companies in the National Guard. There is an abundance material here for a good company, which would be a great advertisement for the city in a trusting attention toward it, for it shows enterprise in public spirit upon the part if the members and the citizens in general. At the present time, the infantry branch of the state's militia consists of forty-four companies, and that number is already organized and assigned, but from time to time companies for various reasons disband, leaving vacancies in the regiment to be filled, and it is quite probable that, should a company be organized here, it would not be very long before it would receive regimental assignment. Watertown's Company E of the National Guard marched off to battle in World War I. 75 years ago Watertown's Company E of the National Guard marched off to battle in World War I. In Watertown's century and a half of existence our men and women have answered the country's calls, but the day Company E left here marked the largest single local effort ever made to fight in one of the country's wars. Of the original Company E, four members lost their lives in the war. They were Sergeant Frank L. Pitterle, after whom the local American Legion Post is co-named, Benjamin Potter, Fred Bergman and Luke B. Dunnigan. Old records show the day when the men left for the war was a pretty somber one. Hours before the men were to leave for war, the crowds were lining up at the armory. That's the building which later became the city's recreation center, and later the site of The Heritage Inn. From there the entourage went to the depot. "Shortly before 9 a.m. the city band paraded the streets, led by Mayor Charles Mulberger and ex-Mayor Herman Wertheimer. The orders to march came and the company lined up behind the band, followed by members of the Red Cross Society and thousands of citizens, who packed every inch of available space about the depot. The special train pulled in at 9:05 a.m.
"The Misses Margaret Abele, Catherine Blair, Ruth Cruger and Helen Schultz carried an American flag through the streets, forming a pocket of it, each girl carrying a corner and soliciting donations for the mess fund of Company E so that the boys might have little items added to their daily fare. The sum of $200 was collected by the girls and was wrapped up by them and given to the treasurer of the company." 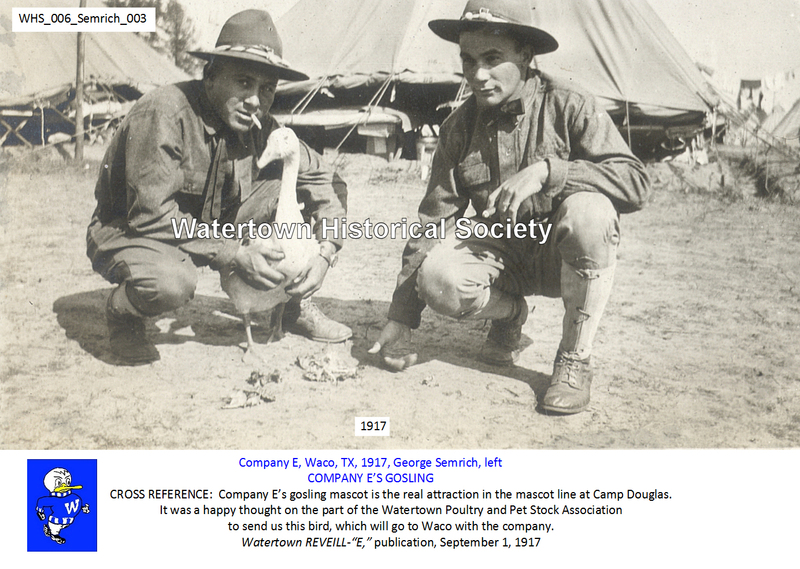 The company was organized shortly after the United States entered the war and left Watertown Aug. 17, 1917, for Camp Douglas. It remained in camp until Sept. 25 when it was sent to Waco, Texas, and became Company C, 120th Machine Gun Battalion. Later it became identified as Company D and continued with that designation throughout the war. The company left Texas on Feb. 4, 1918 for Camp Merritt, N.J., where it arrived on Feb. 10. On Feb. 18 it left for Hoboken and sailed on the George Washington, arriving at Brest on March 14. The George Washington was the liner which later carried President Woodrow Wilson and his party to the peace conference. The first experience of war for the Watertown men came when they were traveling on the ship. The Atlantic was then infested with German submarines and many death-defying experiences were encountered. The company landed at Brest on March 4, leaving for Vousolersl on March 9 and then the Alsace front at Ettuefont and on May 18 the unit was ordered to the front. Until May 29 the company remained at the front and was then sent into the reserves at La Chappelle. Later the company returned to the front and remained there until July 20. From there the company was transferred by train to Chateau Thiery, arriving on July 29 where it encountered its first major battle. Until Aug. 10 the company remained on duty there and was then sent to Joinville and then to Juvigny. Later the men saw action in the famous Argonne Forest, serving from Sept. 20 to Nov. 11 when the armistice was signed and hostilities ceased. The unit had some occupation duties in the ensuing months, but it was on May 21, 1919, that the unit returned to Watertown and was greeted with a welcome of the magnitude that had never been seen here before. A. F. Soliday, captain; J. T. Hale, Jr., first lieutenant; L. W. Murphy, second lieutenant; Alfred Krueger, first sergeant; E. J. Dunn, quartermaster sergeant; Frank L. Pitterle, company clerk. Sergeants - Allen Biefeld, Fred Hollenbeck, Elmer Kehr, William Kubow, James Monroe, Samuel Kontos. Corporals - Edwin Kaercher, Walter Kuester, Edward McCall, Seth Perry, Benjamin Potter, George Semrich, Fred Ullrich, Lester Williams, Benjamin Winkleman. Privates - Alvin Beerbohm, Percy Behlke, Ray Behlke, Fred Bergmann, Raymond Bock, Francis McCall, Ralph Dittman, George Draeger, Luke Dunigan, Clarence Eickstaedt, Fred Erdmann, Herbert Euper, Walter Flint, Thomas Gavney, Herman Gerth, A. C. Gillard, Anton Glun, Thomas Hady, William Hayes, James Hannes, Emil Hoefs, Frank lhde, Albert lhde, Delphus Jackson, Joseph Kioes, Arthur Koch, William Kortegast, Hilmer Krueger, Alfred Kuehnemann, Michael Kunitz, George Lambras. Watertown’s Memorial Bridge, dedicated to the soldiers of WWI, opened in 1923 with impressive ceremonies in which noted leaders took part. The new concrete bridge, “which is considered one of the most beautiful structures of the kind in this part of Wisconsin,” was ornamented with large pillars topped off with twenty-four large electric globes, the light of which can be seen from a great distance. A feature of the bridge’s opening was the presence of Marshall J. Woodard, pioneer resident of this city, who was 93 years old at the time and became the first man to drive across the new bridge. He was one of the oldest and best known residents of this city and was one of the early-day bankers in this city. A Last Man's Club was formed out of the membership of Company E. A special bottle of wine was purchased at the first reunion of the group, and each succeeding year it was brought to the reunion and set in the center of the table and then put back in a vault until the following year. When the membership was down to one member, it was to have been opened and the last survivor was to give a toast to his dead comrades. The annual dinner meeting of the Last Man’s Club of Co. E, Watertown’s military unit in World War I, will be held tonight at Otto’s Inn. The dinner will be served at 6:30 o’clock and the meeting will follow. Present tonight also will be the special bottle of wine which was set aside at the time the club was launched. The plan is that when all but the last surviving member of the group have passed on, the survivor is to meet in session and after his dinner open the bottle and drink the wine. Each year the bottle is shown and then it is put away until the following year's dinner. Present officers of the club are: Allen Biefeld, president; Arthur Schmeling, vice president; Arthur W. Lietzke, secretary-treasurer. Mr. Lietzke said this morning that up to that time he had already received 37 reservations for tonight’s dinner. He said more were expected. Among the men who will be here will be members from New York, Ohio, and other states. Wisconsin cities, too will be well represented. The Last Man's Club of Co. E., Watertown, made up of veterans who served with the company in World War I, held its annual reunion and dinner Saturday night at the Green Bowl. A place of honor was accorded the bottle of wine. Elected president was F. B. Hollenbeck, Percy Behlke, Milwaukee, and Herman Gerth, this city, were elected vice presidents. Seth Perry was named secretary-treasurer. Allen Biefeld was named chaplain. The Legion Green Bowl Saturday night provided the setting for the annual dinner and reunion of the Watertown Co. E Last Man’s Club. Company E was Watertown’s own military unit that went into World War I, leaving here just 50 years ago last Thursday. Members present were Arthur Schmeling, Joseph Westermann, Seth Perry, Thomas Hady, Arthur W. Lietzke, William Kortegast, Otto C. Andel, Bill Hayes, Herbert Manske, Clarence Eickstaedt, Herbert Tolksdorf, Frank W. Luebke, Herman Gerth, Victor H. Marks, Alex Woelffer, Ray Bock, Ferd Schultz, Allen Biefeld, Walter M. Kuester, Percy Behlke, Alphonse Kuehnemann, Otto Toebe, Elmer Kehr, Harvey Emmer, Roy Behlke, Joseph Kloes and James Monroe. The Last Man’s Club of Watertown Company E, a World War I contingent, will hold its 51st annual reunion at the Legion Green Bowl here Saturday night, with a dinner beginning at 7 o’clock. A bottle of champagne, which is kept in the vault of the Wisconsin National Bank, will be brought out and placed in the center of the table. The stipulation, at the time the club was organized, was that the wine was to be drunk as a toast by the last remaining member of the club. After tomorrow night’s dinner the bottle will be placed in the vault until the 1969 reunion. Of the original club members, 47 are known to be deceased, another five have never been contacted for lack of address and 37 are still active. It is expected that some 25 will return for tomorrow night’s reunion. The Company E Last Man's Club will open no wine before it's time. And after 42 years, the last few members have decided it's time. Today at 5 p.m., the three surviving Watertown members will meet at Lindberg's by the River to drink a toast to the 83 members of Company E who have gone before them. Company E fought in Europe in World War I. The company started out as a Wisconsin National Guard unit that trained at Riverside Park before becoming part of the U.S. Army at the start of the war, said Arthur Lietzke, the club's president, secretary and treasurer.